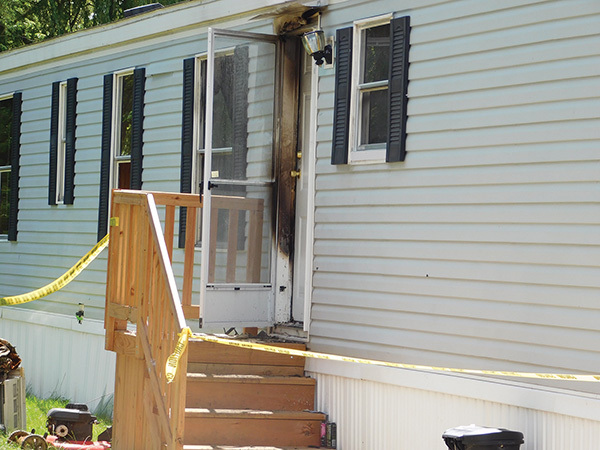 Tag Archive | "air conditioning unit"
Smoke and flames were coming out the door when firefighters arrived on the scene of a fire at this mobile home last Saturday, July 22. Post photo by J. Reed. A polyester afghan sealing off a window around an air conditioning unit caught fire last weekend in a mobile home in Cedar Springs Mobile Estates. According to Cedar Springs Fire Chief Marty Fraser, they received the call at 11:07 a.m., Saturday, July 22, for 336 Carol Street. 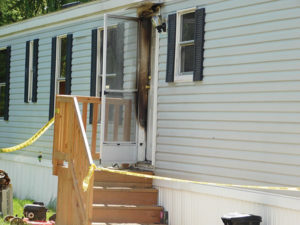 When they arrived on scene at 11:11 a.m., smoke and flames were coming out the front door. And by 11:14 a.m., they had the fire out. “We had a good response time, and it was a quick knockdown,” reported Fraser. He said that the fire was contained to the sofa area in the living room. The air conditioner was above it, with the polyester afghan around it to seal the window. Fraser said that the afghan was brittle and stiff, and that the heat from air conditioner started it on fire, which then started the sofa on fire. The damage to the home was mainly smoke and water damage. The Kent County Sheriff Department was on scene and helped evacuate the family, which consisted of a mom, dad, and three children, including a six-week-old baby. Several animals were also evacuated safely. The family was renting the home, and had no insurance. Red Cross was called in to help render aid. Sand Lake Fire was automatically toned out for mutual aid, but then told to disregard, as was Rockford Ambulance.